Glorybower. Iconic in the city of Portland this small umbrella shaped tree lines streets and populates gardens throughout the city. 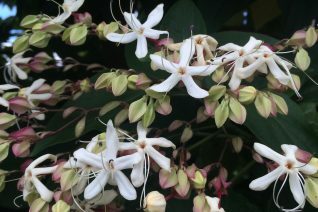 Late summer brings masses of white flowers held in a red calyx that perfume the area for many blocks with a sweet jasmine fragrance. Following the flowers the calyx swells to a red star and a turquoise blue berry forms. To 16′ tall moderately fast in full sun and rich soil with regular summer irrigation. Avoid disturbance around established trees which can cause it to sucker annoyingly. Large tropical leaves have the fragrance of peanut butter when bruised. Little to no fall color. Japan.